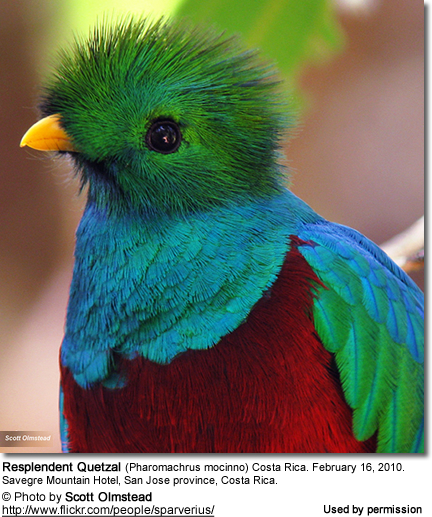 Resplendent Quetzals: The Most Beautiful Birds of All? The Resplendent Quetzals (Pharomachrus mocinno) - also known as Magnificent Quetzals or Resplendent Trogons - are easily recognized by their vibrantly colored plumage. These Trogons occur naturally in the mountainous, tropical forests of Southern Mexico and Central America. Many count them amongst the most beautiful and ornate bird species in the Western Hemisphere, and the natives were so awestricken by their striking beauty that they referred to them as "The Rare Jewel Birds of the World." These birds were sacred to the ancient Maya and Aztec peoples, who viewed the quetzals as "gods of the air" and symbols of goodness and light. 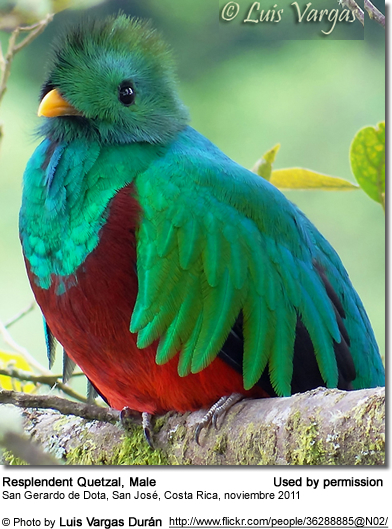 Ancient Indian cultures called this bird Quetzaltotolin ("most precious"). Its common name was derived from Quetzalli, meaning precious feather or beautiful. 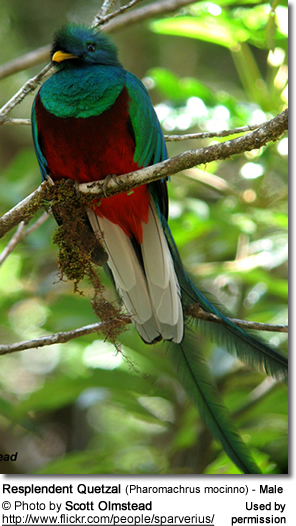 The Quetzal was closely associated with the Quetzalcoat, who was considered the God of creation and a giver of life. This God was depicted as a plumed serpent; the Quetzal (bird) was symbolic of the cloud, while the snake symbolized the wind. The Quetzals were also believed to be the spiritual protectors of the Mayan chiefs, and they would accompany them in battle, and in some cases die with them. Priests and royalty wore their feathers during ceremonies. The spectacular birds are very popular with tourists and, therefore, hold significant economic influence in, and are the subject of great cultural pride of, those countries that they call home. For example, the Resplendent Quetzal is Guatemala's national bird, and its portrait is both on its national flag and the coat of arms. In ancient Mayan culture, this bird's feathers were used as currency and to this day, the local currency is called "Quetzal" (singular) or Quetzales (plural). In Costa Rica, these birds are favorites of Eco tourists that visit the cloud forests and are eager to catch a glimpse of them. capturing of these birds for the pet or tourist trade. The Resplendent Quetzals are, therefore, classified as near threatened on the IUCN Red List, and are now legally protected in Mexico, Guatemala, Costa Rica and Panama. In Costa Rica, natural preserves have been set up to protect their natural habitats and promote eco-tourism - some of them include Braulio Corrillo, Pos, Chirripo, La Amistad, Monteverde and the Los Angeles cloud reserves. In 2009, BirdLife International estimated that about 20,000 to 49,000 of these birds were still found in the wild. The Resplendent Quetzals have a distribution that stretches from southern Mexico through Guatemala, Honduras, El Salvador, Nicaragua and Costa Rica south to western Panama. Their preferred habitats are undisturbed moist rainforests and cloud forests, favoring the cooler mountain ranges from ~ 3,000 - 10,500 feet (900 - 3,200 meters). After the breeding season, they may move to lower elevations. Outside the breeding season, these birds typically live alone. Rarely three up to twenty of them can be found together at popular food sources, such as heavily fruited trees. Males maintain territories that they claim by calling in the morning and again at dusk. Range: Montane forests of southern Mexico (Oaxaca and Chiapas) south through Guatemala, Honduras, eastern El Salvador and north-central Nicaragua. Range: Montane forests of Costa Rica (avoiding the Cordillera de Guanacaste region) and the western highlands of Panama (east to possibly Veraguas). ID: Slightly smaller than the nominate race with shorter and narrower tail plumes. 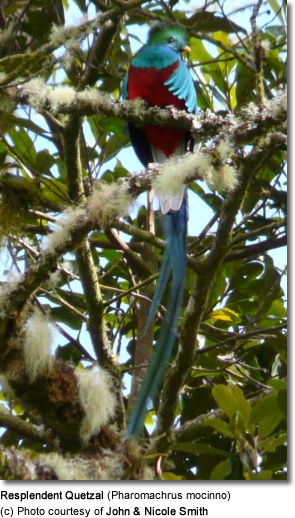 The Resplendent Quetzals are the largest representatives of the Trogon family. Excluding its tail, the length of this quetzal is comparable to that of a Pigeon. 14 to 16 in (36 to 40.5 cm) - from the bill to the base of the tail. The female's or non-breeding male's tail measures about 24 in (61 cm). On the onset of the breeding season, the male grows what many deem to be the most distinctive and flashy feature of this species - the greatly elongated, glossy bluish-green twin tail feathers. They can be as long as 3 feet or close to a meter long, thus more than doubling this bird's overall length. This train of "streamers" is actually formed by the upper tail coverts that extend beyond the bird's white tail. These two streamer feathers fall out after the breeding season, and the tails of the males and females are then of the same length. Other than those two streamer feathers, the male can be easily be identified by the short crest formed by a distinct tuft of bristly golden green feathers on his head. Resplendent Quetzals have a plumage that is a mostly metallic green with variations that range green-gold to blue-violet, depending on angle of the light and the light conditions. The lower chest, the abdomen and the under tail coverts are vibrant red. The female plumage is not as vibrant as that of the male's. Her head ranges from smoky-grey to bronze tinged with green at the edgings. Those areas that are green in the male are brownish to buff in the female. Her head is bronze-green, and below she is greyish. Her plumage below is a more muted red. 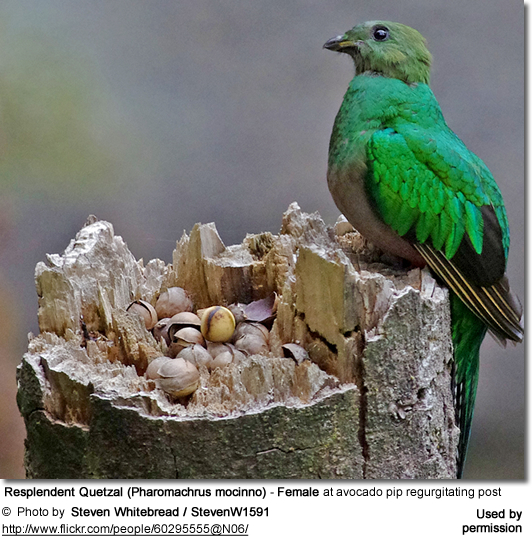 The primary diet of Resplendent Quetzals includes fruits, in particular favoring the berries of the laurel family, which includes wild avocados. They lack a crop - a muscular pouch found on the upper chest of most bird species - that functions to temporarily store food and regulate it through the system. The flexible mandible (lower beak) and clavicle (Y-shaped bone aka wishbone in the upper chest area) allows them to swallow larger fruits whole. The esophagus - which is the tube involved in transporting food from the mouth to the digestive tract - has an elastic, thin wall with rings of circular muscles that is likely to facilitate with the regurgitation of large seeds or pits. 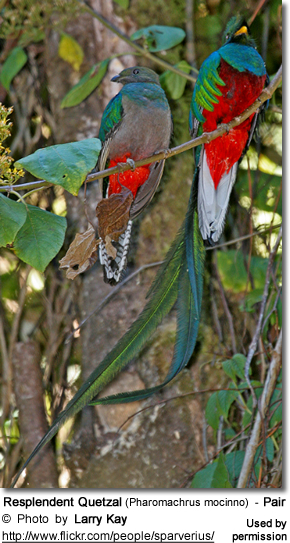 Quetzals also feed on insects (such as wasps, ants and larvae), as well as frogs and lizards, and other small creatures. These great hunters have been observed swooping down and grasping fruit or prey and engulfing it in mid-air. 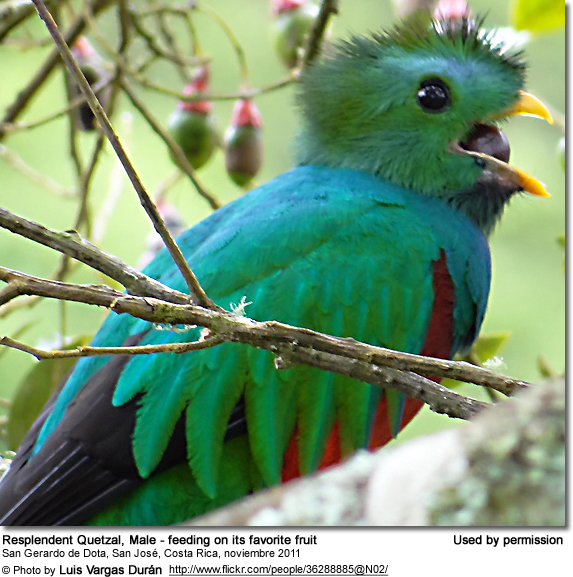 Resplendent Quetzals reach reproductive maturity when they are about 2 years old. Breeding pairs maintain territories of about 15 - 25 acres (6 - 10 ha.). They are seasonally monogamous and produce one to two broods a year. The male wows the female with elaborate flight displays, that involves flying above the canopy and then ascending while singing loudly. Once a male has been accepted by a female, the nest construction commences and the actual mating occurs in association with their shared nest building activities, and copulation typically takes place in the actual nesting chamber. They generally nest in the unlined cavities of dead trees or decaying tree stumps with a single entrance. They either excavate the holes themselves with their beaks or they may use existing hollow spots that they modify to suit their needs. The pair may excavate several sites before actually selecting one. They may also take over old woodpecker's nests. The eggs are laid directly into the unlined nest on the floor of the nesting chamber. The typical clutch consists of 2 pale blue eggs. On occasion, as many as 3 or as few as 1 egg are laid. The parents take turns incubating the eggs. Typically the male incubates the eggs in the mornings and afternoons and the female during the nights and middle of the days. When brooding eggs, the male's long tail feathers are usually folded forwards over the back and stick out of the nest entrance. The incubation of the eggs lasts about 17 - 20 days. The hatchlings emerge without any down and their eyes closed. The egg tooth with which they break open the egg shell (located near the tip of the upper bill) is still visible. Their eyes remain closed for seven to eight days. Pin feathers start to develop when they are about two days old and at seven days, the contour feathers are breaking from their sheaths. When they are about two weeks old, the nestlings have most of their down feathers and their first green feathers appear about 18 days after hatching. Their first feathers are pale and very soft. The color of the plumage is at that point similar to that of the female's, consisting of muted tones of greys and dull greens. The young birds at this point lack the red markings that both adult birds possess. For the first ten days, both parents feed their young a diet that almost exclusively consists of insects, as the chicks need the protein to support their rapid growth. After about 10 - 14 days, the parents introduce other foods into their diet, such as fruit, berries, and small vertebrates, such as small frogs, lizards and snails. The female is said to abandon the chicks towards the end of the nesting period at which point the male takes over their care. When the chicks are about three weeks old, they typically approach the entrance hole of the chamber and the male teaches them to fly. 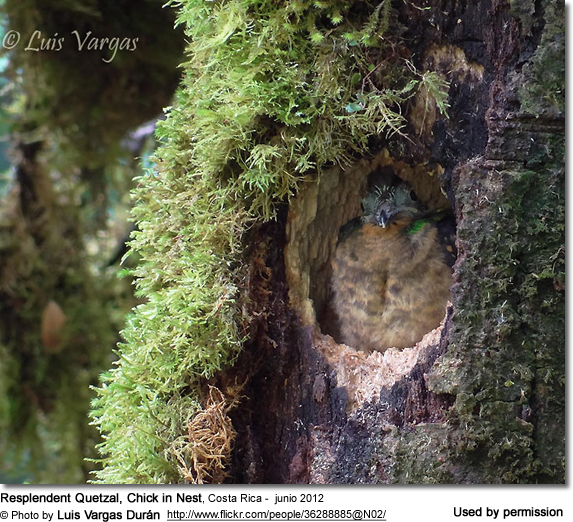 Less than 20% of the eggs or nestlings survive due to predation by other birds, such as toucanets and brown jays, and mammals, such as squirrels and weasels. Their warning or sentinel calls are described as weec-weec; their calls made in flight or when agitated as a sharp crackling "perwick"
The male's territorial call comprises two hollow high-pitched notes, one ascending steeply and the other descending. Rendered as keow-kowee-keow-k'loo-keow-keloo or kyow or sounding like "a whimpering pup"
During the breeding season, he vocalizes to attracht females and his song is reminiscent of "very-good very-good."